A scratched or dented vehicle can quickly become an eyesore. You naturally want to get scratches removed and the original paint restored so that you can once again drive your car with pride. However, car painting cost is often a barrier for most people. We are a custom auto paint shop that offers customized services. Whether you require simple car painting or you want us to repair the vehicle and then paint it, we do so with the best quality in workmanship. Having top-of-the-line equipment and machines, we are guaranteed to provide the best quality repairs and painting jobs. 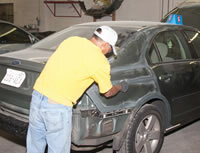 If your vehicle has been damaged after a collision or any other accident, it will need proper repairs and car painting. If you are worried that the original color of your car and the new color will not match, rest assured as we have a computerized color matching system that enables us to match the auto painting colors exactly. You can rely on our experienced and efficient technicians for superior quality repairs and services for all models of cars and other vehicles. If you are worried about the car painting cost, let us assure you that you will receive great value for your money. There might be several companies offering auto painting services in Fife, but car painting and auto painting jobs are best left to the experts. We are the ideal auto paint shop to choose for auto painting in Fife as we possess all these features and many more. If your car has been damaged in a collision and you are looking for a reliable auto paint shop in Fife, call Lakewood Auto Body at 253.581.0220.